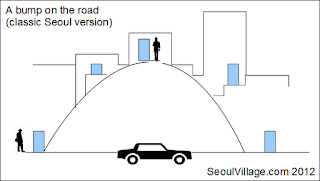 Saying that Seoul is hilly is a bit like saying that Chicago is windy, but it doesn't show as much as it used to: over the past decades, the city has been carpeted with high rise "apateu" blocks, and hungry caterpilars have bitten off most hilltops. In many cases, new roads simply cut through the highest hills that used to separate villages nesting on each flank. 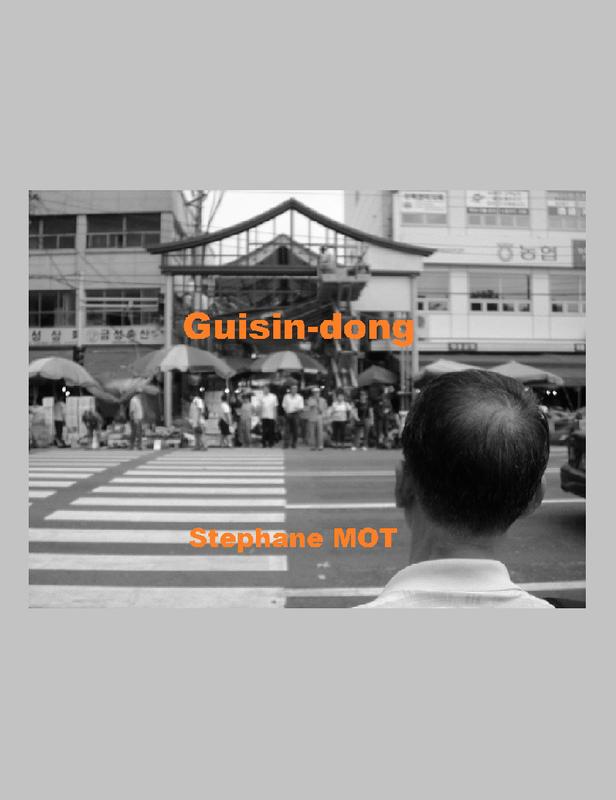 Picture a hot metal bar lowered on a butter mound: it doesn't cost as much as a tunnel, but leaves disgracious concrete walls on both sides of the road - barren Gaussian curves where the city ceases to exist. Sometimes a bridge connects the former halves of a same neighborhood but only the few people living on the very top use them, and you have to go down at least 500 m on either direction to find a pedestrian crosswalk and risk your life through six lanes of traffic. Final score? Cars 1-0 Humans. 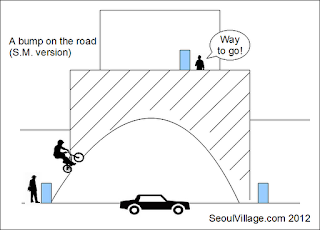 But don't imagine that the guy on the bottom left of this drawing can reach the door on the bottom right without passing by the guy on the top of the hill. That would be too easy. Most of the time, local planners considered that one sidewalk was enough. After all, for many of them, cars seem to be the most important beings in the city. Every week-end, I ride my bicycle to Yonsei University where I play soccer... or rather a sport that vaguely ressembles soccer when I'm on a good day. 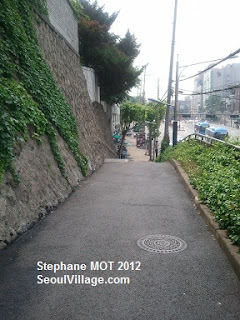 From Yeonhui-dong, I have no choice but to use the Northern sidewalk along Seongsan-ro. And if I survive the dangerous entrance to Dongseo Oriental Hospital (see "medical tourism"), I have to face not one but two of those bumps before reaching the stadium. The second bump is no biggie (even if elder citizens would not agree with the statement): its highest point must reach about 2.5 m over street level. Furthermore, the elevation makes possible the connection between a minor tributary and main street, and fluidifies both foot and car traffic. But the first bump... that mean, steep, 75 m long nightmare shouldn't even exist anymore. 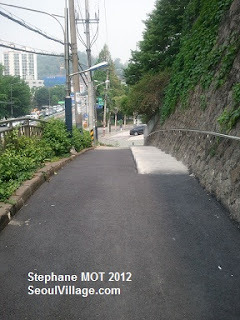 If I've climbed much steeper slopes in Seoul, this one makes me very very angry. Granted, it gives me a perfect alibi for my poor performance later at Yonsei, but I'm sure everybody in the area would love to see it disappear. Of course, the obvious thing to do would be to get rid of the hill altogether and to prolong the mansion's walls to street level. That wouldn't cost much, and would change the lives of many citizens. So last year, when I saw a group of workers studying the hill, I thought that, at long last, change was coming. All they did was to put a metal handrail along the mansion wall. I'm sure Seodaemun citizens felt offended and said something because a few months later, more workers came. That's it, I thought, they're really going to fix it. They erected a staircase on both sides of the hill. More concrete, yeah! And to sign their masterpiece, they've just put a brand new layer of asphalt. A cherry on an unedible cake. How much for these three brilliant interventions? For the same price, I bet they could have sliced at least half of the monster, and that would have made a lot more difference. I can't wait for the next touch: a marquee to protect sweating bikers from the baking sun during their ascent of Seoul's Mont Ventoux?